A very special thanks to my design collaborator Willo Bellwood of Metric Media for her amazing talent. Her graphic sensibilities translated this multilayered concept into a powerfully visual piece. 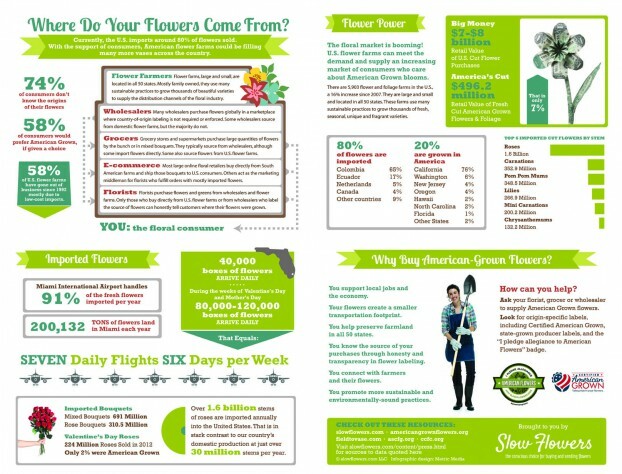 “Where Do Your Flowers Come From?” communicates the facts, fallacies and data about the source of flowers – and inspires consumers to source domestic and local flowers. This entry was posted on Tuesday, September 29th, 2015 at 12:30 pm	and is filed under American Grown, Blog Posts, Creativity, Flower Farming. You can follow any responses to this entry through the RSS 2.0 feed. You can leave a response, or trackback from your own site.